Secret Santa at OnlineAuction.com! Shhhh… don’t tell anyone! Welcome to OnlineAuction.com’s Third Annual Secret Santa Event! It doesn’t matter if you are a Buyer or a Seller, if you are an OLA Member, you can join in the fun! 1. Sign Up On This Thread To Participate in The 2010 Secret Santa Event. Sign ups will close on October 30, 2010. 2. Fill out a question a about yourself, which will be O-mailed to you on Monday, November 1, 2010. 3. Return the questionnaire by November 8th. 4. On (or about) November 12th, you will receive a SS Assignment. This is who you will be buying for. 5. You may spend no more than $20 (tax included) on a gift for your SS Assignment. Example: You find an item that is worth $25 but are able to buy it for less than $20. As long as it you spend no more than $20, the actual gift can be worth more. 6. The gift you send must be worth at least $10. Example: You find an item that is worth $10, but get it on sale for $3. The item is still worth $10 no matter what you paid for it and therefore is acceptable. 7. Postage does not count towards the price or value of the gift. Postage is separate and cannot be counted as part of the gift value. 8. You must mail your gift on or before December 1, 2010 and send it in such a way that it is expected to arrive on or before December 10. You must mail the gift using a tracking or confirmation number. Once you mail your gift, you will O-mail the tracking or confirmation number to SecretSanta (a Basic Member Account has been set up to receive all Secret Santa omail). 9. You cannot tell anyone who your assigned Member is. Care should be taken when you mail to hide your identity without breaking postal rules. I suggest you get someone else to mail it for you, like the person you buy it from! 10. When you receive your gift, it is your choice as to when you open it. Whether you open it immediately or choose to wait, you do need to let me know that you’ve received it by O-mailing me at Secret-Santa. I will also put up a new thread just for Thank You’s. Let your friends, your colleagues, and your customers know that the Third Annual OnlineAuction.com Secret Santa Event has begun! Don’t Wait !! Sign Up Today!!! This post is from Metzy! If I messed anything up forgive me! Have a great day and thanks for reading my blog! Looks like the car from Days of Thunder is up for Bid! This Mellow Yellow race car is marked #51 and does have Cole Trickle‘s name across both sides of the roof. This car has been used, and not lightly in the movie and it shows. The body is bruised up and does have damage which was necessary in filming the movie. Up for bid! This is the real deal ladies and gentlemen! 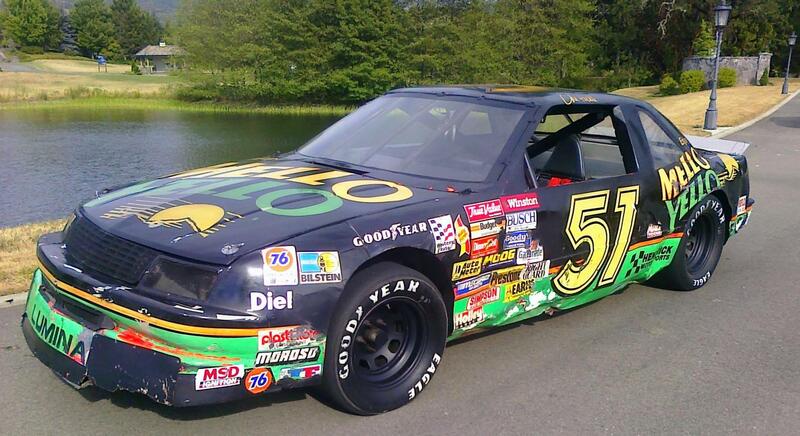 Famous 1988 Chevy Lumina Nascar #51 “Mello Yellow” Used in the movie Days of Thunder! This car was driven by Tom Cruise in the high point of the movie where Tom Cruise performs a last lap pass to cross the finish line first, and win the Daytona 500! The car runs and drives and sounds like a nascar! The car has a Built 350 V-8 with Dry Sump oil pump, Victor intake manifold, Holley carb, Tuned step headers, HEI ignition, Aluminum race radiator, I believe it to be a Hendricks motor sports chassis with adjustable suspension, 4 wheel disk brakes, 9” rear end, 3 speed manual. The car has been in Museums most of its life, until I purchased from another private collector. I do have documentation on the car. The car also comes with 2 Jump suits used in the movie. Also has an airtank that was given with the car labeled #51 painted to match the car. This is a car that does not come across the auction block often, and most likely you wont see it up for sale in years to come. The last Mellow Yellow Race Car that came up on the auction block a couple years ago was also used in the movie not playing as big of a part had a hefty price tag of $250,000 My price is much more reasonable. This Mellow Yellow race car is marked #51 and does have Cole Trickle’s name across both sides of the roof. This car has been used, and not lightly in the movie and it shows. The body is bruised up and does have damage which was necessary in filming the movie. In the cockpit of the car there is a label that says ‘” Tire Water Spray” that no longer has the equipment but was used in the film for burnouts, and to get the car sideways easier. This is a car that is well known and everyone remembers! The film was a film that inspired lots of people and was a turning point in the world of NASCAR. If your a museum owner it would be a great car to add to your collection people will pay to see this car! Or if your just a collector like me you wont regret the bragging rights! I also have some cool memorbilia and newspaper articles and a cd/dvd of behind the scenes of making the movie. This car is being sold as-is no warranty. I prefer wire transfers or cashier checks verified by your bank. Okay I finally found the twitter button Sheesh! Yes, it only took me like two hours to find the Publicize button on the right to send to twitter! OnlineAuction has a better user base than most and a useful set of features. If you’re looking for an alternative auction site to eBay, OnlineAuction is certainly an option. There are absolutely no fees for basic membership, which allows users to bid and buy simply by registering. Becoming a verified buyer costs $4 a month, and entitles you to utilize a private O-Mail account, feedback and added security. To sell on OnlineAuction, you must pay an $8 per month fee, but then you can list items for free and not accrue any final value fees. Several auction sites, including eBay and eBid, require final value fees to be paid after an auction. This is not the case with OnlineAuction, but keep in mind that you do have to pay the $8 fee if you wish to sell any items. If you pay the fees upfront for a year ($96), you can also take advantage of some free auction enhancements. OnlineAuction’s attention grabbers are somewhat limited in comparison to other online auction services, but include category featuring for $10. Listing your item in two categories is completely free, allowing potential buyers to more likely to see your item. Selling on OnlineAuction is simple and can be tailored to different selling options. If you have several items to sell, you might consider opening an online store, which is completely free at OnlineAuction. You can even cross promote your items within various listings, drawing attention to other items you have to sell that potential buyers might be interested in. Sellers at OnlineAuction.com can block bidders that they don’t trust, and they have the option to end an auction early should the need arise. Sellers can remove their listings for free as long as nobody has placed bids on them. Searching and finding what you’re looking for is simple on OnlineAuction.com. Advanced searching is available and allows the user to search for auctions by categories, item number, the member auctioning the item, or even search for what items specific people are presently bidding on. You can even search the auctions by setting a price range. Sorting the listings is also easy to customize. You can sort the search results by price (high or low first), number of bids, or time remaining. Searches are listed in a gallery with 11 listings on a page. The pictures for each listing are decently sized, but you can also choose between three different sizes (located at the bottom of the page). Making at-hand image viewing even easier, scrolling over the picture provides an enlarged view of the thumbnail image. If you’re interested in seeing who bid on an item and when, you can access the history of any item. With this, you will be able to see how many people have bid on the item, when they bid, and for how much. You can also quickly see how many people have viewed the auction listing. OnlineAuction utilizes a user feedback system, allowing sellers and buyers to provide feedback on their auction and transaction experiences. OnlineAuction presents a user’s rating so other members can see how many successful auctions they have been a part of and decide whether they want to trust them or not. Another nice feature that OnlineAuction provides is the ability for buyers and sellers to respond to feedback left about them. Adult auctions are not allowed at OnlineAuction. OnlineAuction started business in 1999 and is accredited by the Better Business Bureau. 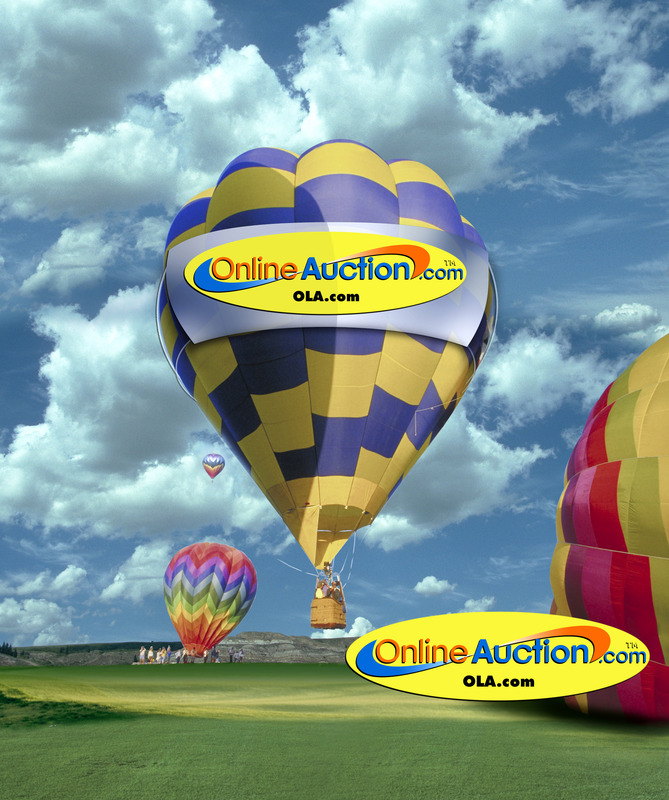 OnlineAuction has several options for users to get help with any issue they might have with buying or selling. The help and support center addresses a variety of topics. Members can also get help from other members through member chat rooms. OnlineAuction is a great online auction service, combining an easy interface with a healthy user base and strong tools for buyers as well as sellers. Auctions on OnlineAuction are simple, straightforward, and easy. If you’re a seller who needs an ebay alternative with no selling fees (other than membership), OnlineAuction is a great option. For another eBay alternative, take a look at our #2 reviewed online auction site, ebid.